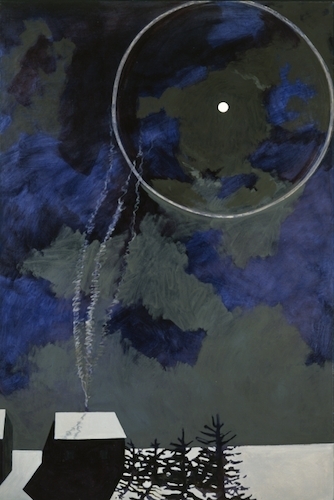 Lois Dodd, Moon Ring, 1982, oil on canvas, 60 x 40". The Paul J. Schupf Wing for the Works of Alex Katz, at the Colby College Museum of Art, is a wing dedicated to, as its name suggests, a permanent, rotating display of Colby’s considerable collection of Katz’s work. Currently on view is an impressive mini-retrospective, “Maine/New York,” showcasing Katz’s expansive landscapes and fashion-forward figures. To accompany the show, Katz has tried his hand at curating, installing a small selection of paintings, drawings, and photographs from the museum’s holdings in an unassuming little room adjacent to his custom-built wing. Surprisingly, this side exhibition, “Interior Visions,” is so striking that it takes to task Katz’s mural-size canvases next door. The pieces in the show, though geographically and chronologically diverse, unite in how the private psychologies of their makers alter the representational nature of the works—a process almost absent in Katz’s athletic renderings. The most pointed example may be Lois Dodd’s Moon Ring, 1982. Smoke escapes from the chimney of a little home covered in snow, reaching up to a moon encircled by a large white ring—a lunar halo whose presence, though perhaps observed, is given such transcendent prominence that one might assume that moons always have rings. Dodd’s moon ring has a rapport with the auric trees of Charles Burchfield’s transcendental Brown Land, 1962–63, also on display. At the abrasive end of the spectrum, Joyce Pensato’s Daisy, 2007, a larger-than-life canvas coated with layers of monochromatic, toxic enamel, bears the leering face of Daisy Duck, perverted by a part of the artist’s character we dare not imagine.